Dulwich Brass performed alongside the choir, also providing some interludes in a detailed musical programme. Peter Mitchell, an accompanist for BBC2’s The Choir series (with Gareth Malone) featured on piano, along with Hackney Singers’ repétiteur Andrew Storey on organ. Tenor Paul Austin Kelly, an international opera star who has performed in productions in Italy, Malaysia and Singapore, joined the choir for Hiawatha’s Wedding Feast. His performance culminated with a solo, Chibiaibos’s Song, whose call to “awake!” shook the church’s foundations. The Victorian interior of St. Mary’s, built in the 1850s, had been dressed and lit by the choir’s team for the occasion. “The way in which it was done was similar to a theatrical production”, said Shanahan. “The church told me that they were absolutely delighted with the whole event”, said Wendy Saville, choir member. One audience member summed up the mood of the evening. “Well, you don’t get that at Covent Garden, do you?” she said. “It was a real treat”. Founded in 1973 as an evening class as part of the Hackney Institute Adult Education programme, the Hackney Singers are a 150-strong community choir drawing members from Hackney, surrounding boroughs and across London. In this 40th Anniversary Year we present an evening of enchanting Victorian music, comprising Bruckner’s Motets and Hiawatha’s Wedding Feast by Samuel Coleridge-Taylor. The concert features internationally acclaimed tenor Paul Austin Kelly and a specially-formed brass ensemble Dulwich Brass, directed by renowned conductor Mark Shanahan with accompaniment by répétiteur Andrew Storey. After performances in the past year at the Royal Festival Hall, at the Olympic Stadium as part of the Paralympic Games opening ceremony and the newly-reopened People’s Palace in Stepney, the choir returns to Hackney to the atmospheric Victorian interiors of St Mary’s Church, Stoke Newington. Austrian Composer Anton Bruckner (1824-96) composed several Motets (choral settings of sacred text, sung unaccompanied or with minimum accompaniment) in addition to his well-known symphonies, and Hackney Singers will be performing seven of the finest of these. Hiawatha’s Wedding Feast by British composer Samuel Coleridge-Taylor (1875-1912) was so popular in the 1920s and 1930s, a fortnight’s-worth of performances were staged at the Royal Albert Hall every year, to large and enthusiastic audiences. Once called the “Black Mahler”, Coleridge-Taylor was born in London, the illegitimate son of Daniel Hugh Taylor, a doctor from Sierra Leone, and Alice Martin, an Englishwoman, and studied at the Royal College of Music under Charles Villiers Stanford. Hiawatha’s Wedding Feast is the first of a trilogy of cantatas The Song of Hiawatha, telling the story of Native American Hiawatha, raised by his grandmother Nokomis on the shores of Lake Superior, and who married the Dakota maiden Minnehaha. Most twentyfirst-century music-lovers would probably associate Anton Bruckner (1824-96) mainly with symphonies – monumental constructions of great power and beauty. But given his musical background – he was a chorister at the monastery of St Florian, near Linz in northwestern Austria, and later organist to the Imperial Chapel in Vienna – it is hardly surprising that he should have written many memorable religious choral works. He made several contributions to the relatively small-scale genre of the motet (a choral setting of a sacred text, sung unaccompanied or with minimum accompaniment), and the Hackney Singers are performing seven of the finest of them. Afferentur regi An offertory based on words from Psalm 44, and composed in 1861 for Bruckner’s old school. The contrapuntal writing shows the result of many years’ study. Pange lingua This limpid setting of St Thomas Aquinas’s Corpus Christi hymn was made in 1868. Locus iste The text comes from the Mass for the Dedication of a Church. Bruckner composed the music to it in 1869, to celebrate the consecration of the votive chapel at Linz cathedral, and (as with Christus factus est) dedicated the motet to the Benedictine Father Otto Loidol of Kremsmünster. Tota pulchra es An antiphonal hymn to the Virgin Mary and a prayer for her intercession, using words from the liturgy, which was composed in 1878 and dedicated to Bishop Rudiger of Linz. Os justi Bruckner set this extract from the service for Doctors of the Church in 1879, and dedicated it to Ignaz Traumihler, director of music at the monastery of St Florian and a leading member of the Cecilian Movement for the reform of church music. Broadly speaking, this movement sought to return the music of the Roman Catholic church to its sixteenth-century polyphonic roots, and Bruckner incorporated many of its requirements (such as the avoidance of sharps and flats) into this motet. Fittingly, it ends with plainsong alleluias. Christus factus est This was Bruckner’s second setting of the gradual, which forms part of the Mass for Maundy Thursday. The words are from Philippians 2:8-9. It was written in 1884 and dedicated to Father Otto Loidol. Starting quietly, it builds up to a fortissimo climax at the words ‘quod est super omne nomen’, then dies away to a soft but dramatic conclusion. Ecce sacerdos This grandiose setting of the antiphon Ecce sacerdos magnus (‘Behold the great priest’) was made in 1885 to celebrate the thousandth anniversary of the diocese of Linz. Just before the end its sumptuous chromaticism is interrupted by a few phrases of plainchant, but the nineteenth century soon reasserts itself. Oh, the fickleness of fame and fashion. In the 1920s and 1930s, a fortnight’s-worth of semi-staged performances of Hiawatha’s Wedding Feast were put on at the Royal Albert Hall every year, to large and enthusiastic audiences. Today, few people have heard of it, let alone heard it. Much the same could be said of its composer. 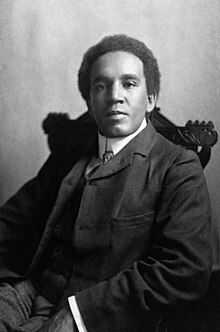 Samuel Coleridge-Taylor (1875-1912) was born in London, the illegitimate son of Daniel Hugh Taylor, a doctor from Sierra Leone, and Alice Martin, an Englishwoman. He showed considerable musical aptitude at an early age, and entered the Royal College of Music in 1890. He studied composition under Charles Villiers Stanford, who recommended him to the music publishers Novello. Another of Novello’s composers, Elgar, put Coleridge-Taylor’s name forward to the Three Choirs Festival. This resulted in a commission, and his Ballade in A minor for orchestra was premiered in Gloucester in 1898. It looked as though young Samuel could be about to go places, and just two months later Stanford conducted the first performance of his new cantata, Hiawatha’s Wedding Feast. It was a huge success, and made Coleridge-Taylor’s name: it was widely performed subsequently, both in Britain and the USA, and the printed score sold in prodigious numbers (for Novello, it was their best-selling publication since Mendelssohn’s Elijah (1846), but unfortunately Coleridge-Taylor had sold the copyright to them for £15, so he never got any royalties from it). All this early promise was never fully realized, though. He wrote two more Hiawatha-themed cantatas, The Death of Minnehaha (1899) and Hiawatha’s Departure (1900), and composed a wide range of other choral, orchestral and chamber music, including a moderately well-known Violin Concerto (1912), but none of these remotely approached the popularity of Hiawatha’s Wedding Feast. Coleridge-Taylor died in 1912 of pneumonia, probably exacerbated by overwork, and is today remembered, if at all, as the first British black composer to make his mark in classical music. Secular dramatic cantatas were popular with audiences at the end of the nineteenth century (other successful examples included Sibelius’s Kullervo (1892) and The Spectre’s Bride (1885) by Dvorák, Coleridge-Taylor’s musical idol). The work of the American poet Henry Wadsworth Longfellow was also widely admired, so verses by him would have been a natural choice as a libretto (Elgar had already taken that course for his cantatas The Black Knight (1893) and King Olaf (1896)). It seems to have been Stanford who suggested his Song of Hiawatha (1855) to Coleridge-Taylor, but it clearly had a great appeal for the young composer, both for its exoticism (including its wealth of what he called ‘funny names’) and for the opportunity it gave him to present (an admittedly second-hand version of) a non-white culture in musical form. Those few who have read any of it today probably remember it chiefly for its unrhymed trochaic tetrameters (tum-tee tum-tee tum-tee tum-tee) which pound on from page to page with incantatory, almost hypnotic effect. There was a historical figure called Hiawatha, a Native American statesman of the late sixteenth century, but he shares nothing but a name with the hero of Longfellow’s narrative poem. This relates how the young Hiawatha was raised by his grandmother Nokomis on the shores of Lake Superior, married the Dakota maiden Minnehaha, and after a series of adventures departed for the Isles of the Blest to rule the kingdom of the Northwest Wind. Coleridge-Taylor selected the wedding scene for his cantata, which tells of the pre-nuptial feasting, the dazzling dance performed by Pau-Puk-Keewis, the song sung by Chibiabos and (comic relief) the boastful story-telling of Iagoo. Coleridge-Taylor gives most of the text to the chorus, but he sets Chibiabos’s song (‘Onaway! Awake, beloved!’) as a solo, which in the first two-thirds of the twentieth century was a favourite piece among English tenors. The music is undemanding, perhaps, but engaging, and only very occasionally lapses into banality (one critic described Coleridge-Taylor’s melodies as ‘rapturous, if anodyne’, and his biographer William Tortolano wrote of Hiawatha’s Wedding Feast that it was ‘constructed upon a few simple but ingratiating melodies’). A period piece, then, but still one with great potential to delight and beguile. Little-known fact: Coleridge-Taylor gave his only son the name Hiawatha. Paul Austin Kelly’s honey-toned, lyric tenor voice has earned international acclaim during his distinguished career as a star of the opera world, performing leading roles with Metropolitan Opera, Covent Garden, Glyndebourne Festival, and Milan’s La Scala opera houses. On the concert stage, Paul has sung repertoire including the Rossini Stabat Mater with conductor Riccardo Muti at the Théatre des Champs-Elysées in Paris, Haydn’s The Seasons and Creation, Bach’s B Minor Mass at Notre Dame in Paris, St Matthew Passion, and Christmas Oratorio, Mozart’s Requiem, Britten’s Les Illuminations, Handel’s Messiah and Samson, Beethoven’s Ninth Symphony in Malaysia and Singapore, and Verdi’s Gerusalemme at the Amsterdam Concertgebuow, among numerous other concert appearances. He has recently given a Schumann recital in Dublin, and has appeared on the BBC’s Friday Night is Music Night as well as numerous radio appearances for BBC Radio 3. His recordings include La romanzesca, Zoraida di Granata, L’Esule di Granata, Rossini – Three Tenors, Cendrillon, several volumes of Il Salotto (Opera Rara), Der Stein der Weisen (Telarc), two volumes of Rossini Cantatas under the baton of Riccardo Chailly (Decca) and Britten & Quilter: 20th Century English Art Songs (GM Recordings). His performance as Tonio La fille du Régiment from La Scala, Milan, is available on DVD. Counting in his operatic repertoire such Rossini tenors as Almaviva, Lindoro (Italiana in Algeri), Ramiro (La Cenerentola), Ilo (Zelmira), Oreste (Ermione) and the Pescatore (Guglielmo Tell), Paul has also excelled in Mozart roles such as Don Ottavio, Belmonte, Tamino, and Tito, and has frequently sung Donizetti’s Tonio (La Fille du Régiment) and Ernesto (Don Pasquale), Verdi’s Alfredo (La Traviata), Bellini’s Elvino (La Sonnambula), as well as repertoire by Haydn, Berg, Puccini, and many other composers. An American by birth, Paul has an affinity with the Great American Songbook. His CD with legendary pianist and music director Kenny Clayton, The Song is You, features these timeless classics sung with style and peerless vocal excellence. Paul has also toured the UK and Ireland with soprano Lesley Garrett as her guest artist. As further proof of his musical versatility, Paul is founder and co-director of Walking Oliver Productions Ltd, (www.walkingoliver.com) a music company and CD label devoted to the creation and preservation of quality music for children. An arm of this company is devoted to promoting the recordings of independent family music artists for distribution in the UK. For the past fifteen years, Paul and his family have lived in Lewes, East Sussex, where they enjoy the proximity to Glyndebourne, to the South Coast, and to the Downs for walking the dogs. Peter is a music director, accompanist and workshop leader. Peter is the Associate Music Director of the Armonico Consort and Music Director for the Lewisham Hospital Choir (The Choir Series), The QC Singers and the Adam Street Singers. He is a vocal tutor for Hackney Music Development Trust and for Junior Royal Academy (dep) and the choral director for the Suzuki (LSG) International Summer School. Peter is an accompanist for BBC2’s The Choir series with Gareth Malone and appears for BBC1’s The One Show as a featured pianist. Peter works with numerous education partners including: The Royal Opera House, Ex Cathedra, English Pocket Opera, Dulwich College, and Arts Insight. As a creative partner with several SEN schools he has created a succession of new, original musicals for schools. Peter is also a music arranger and transcriber for numerous companies and works as a session musician with various independent labels. Peter’s arrangement of Bill Wither’s ‘Lovely Day’ became a YouTube sensation when used during a Flashmob Wedding Proposal leading to live broadcasts on BBC Radio Five Live and global media exposure (YouTube: 19:57 to Euston). Recent credits include 42nd Street (UK Tour) as Cover MD/Keys 2; Snow White and the Seven Dwarves (Bath Theatre Royal); The Sound of a Voice (Philip Glass UK premiere, repetiteur); Monteverdi’s Flying Circus (Assistant MD, UK Tour); Oklahoma! (Keyboards, European Tour); Cinderella (MD, Qdos Pantomime).